Garner had eight men killed in the Vietnam War. 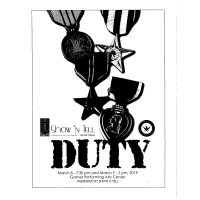 Those young men, and the other community men who went to war, are the subject of “Duty,” the latest in a series of play about the community. The shows will be March 8 (7:30 p.m.) and March 9 (2 p.m.) at the Garner Performing Arts Center. Tickets, $15 and $20, are available at the Garner Chamber of Commerce or on-line at http://garnerperformingartscenter.com. Complimentary tickets for military personnel and military veterans can be reserved by emailing retha.lineberger@gmail.com. “Duty” focuses on the eight fatalities and explores the long-lasting effects on the men who survived the war. Three of the community men who were killed were awarded Silver Stars, the third highest U.S. military honor. Two others received Bronze Stars with valor. “The community is growing so rapidly that many of our people have no idea about the history of the community,” said Tim Stevens, the play’s author. “But even if you’ve lived in the area all your life, you’ll probably learn a great deal about the community’s history. The objective is to preserve our area’s history in a way that is memorable and entertaining.” Garner may be the only town in the country that has an ongoing series of plays about its history. The previous four plays focused on the Civil War and World War II, plus shows about the year Garner Senior High won the state high school football championship and the year Garner schools were integrated. The last three of the plays have been awarded recognition by the North Carolina Society of Historians. The shows have been taped in order to provide a record of the community's history. Broadway’s Craig Schulman, the only actor to play the lead roles in “Les Misérables,” “Andrew Lloyd Webber’s Phantom of the Opera,” and “Jekyll and Hyde” will direct the show, which is produced by Show N Tell Ministries, a non-profit corporation that also presents patriotic events throughout the year. For more information, contact Tim Stevens at (919) 812-5711.